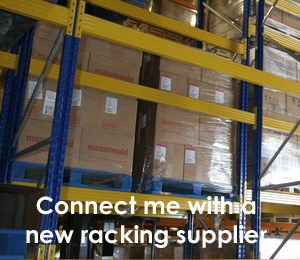 Standard pallet racking in the UK is often referred to as adjustable pallet racking or APR. Basic pallet racking is a fairly simple system comprising of two main components the racking frames and the beams. The frame is made up of two uprights and horizontal and diagonal bracing. Back to back runs are normally tied together with a row tie. Pallet racking is manufactured and installed to the SEMA code of practice to give the user confidence in the quality of both the product and the installation. 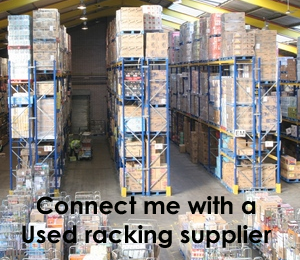 Pallet racking must be planned in conjunction with the mechanical handling equipment I.e. the fork lift trucks. Standard pallet racking is generally used with a counter balance truck or a reach truck. It is also used in what is known as VNA (very narrow aisle) and double deep racking but this is covered seperately. Frame is the end that supports the beams. It is constructed from two uprights, feet and bracing. Upright is a single upright that is part of the frame. Beams are the supports that the pallets are placed on. Floor bolts are used to fix the racking to the floor. All uprights should be bolted to the floor as per the manufacturers instructions. Row ties are ties that tie two frames in a double run. Guide lines state that these should be placed at 2500mm apart maximum, with a minimum of two per back to back frame. Pallet support bars are lateral beams that fit onto the main bearer beams at 90 degrees to give extra support to pallets. Bay is the term given to the space between two pallet racking uprights. Levels is the levels on which pallets are placed this would normally include the ground floor eventhough there is not normally a beam at that level. So a bay with three levels will have two beam levels. Pallet positions is the term given to the number of pallet positions with a pallet raking system or bay. 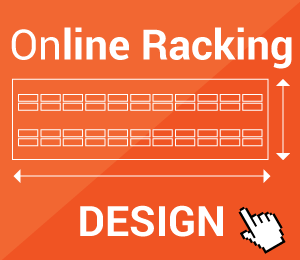 When designing a pallet racking installation their are a number of factors to consider. The physical details of the warehouse is obviously an important factor. Special consideration should be given to fire doors and access to them. Fork lift truck performance is of paramount importance. Turning circle, lift heights, lift capacities, end of aisle clearances, closed mast height are all important factors to the design of the racking. 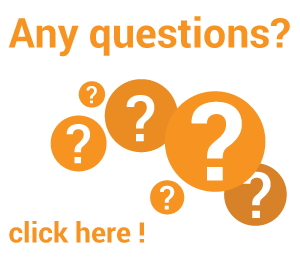 Which way do pallets come into the warehouse and which way do they go out. Much time can be wasted handling pallets that are stored the wrong way round. SEMA clearances should be considered. Is there any overhang of the product over the pallet. Is the pallet 4 way or 2 way.